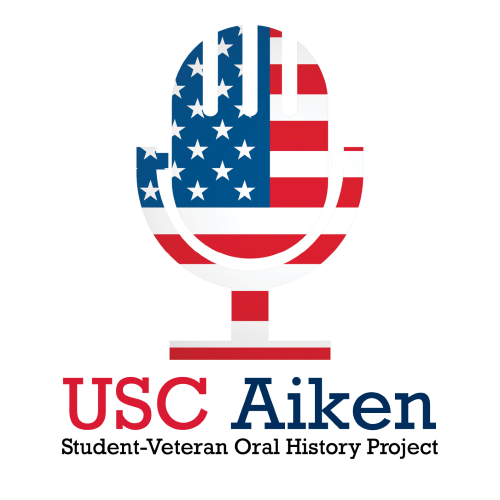 The USC Aiken Student-Veteran Oral History Project collects, preserves, and makes accessible to the University of South Carolina, Aiken community and the wider public the experiences of USC Aiken’s student-veterans in order to foster understanding of the transition from military life to higher education. These oral histories are collected by students of Dr. Douglas Higbee, USC Aiken English professor. Invaluable logistical assistance has been provided by Rob Murphy and Tristan Stone, of the USC Aiken’s Veteran and Military Student Success Center, and Keith Pierce, director of USC Aiken’s Ruth Patrick Science Education Center studio. Click on an interviewee’s name to access their video interview, their biographical information, and the name of the interviewer, as well as a verbatim transcript of the interview and a topic index. Because the video files are rather large, it may be helpful to save/download the file to your hard drive before trying to view it.